FACE provides coordinated, transparent, and collaborative mental health services for social, emotional, and behavioral concerns for Boone County youth (0-19) and their families. The goal is to improve access to quality mental health services. FACE also provides training opportunities for mental health professionals. The 13th Circuit Court works with Family Facets to provide home visitation and parent skills training for families with children placed out of the home. The goal is to reduce the amount of time children are placed out of the home by increasing parental readiness for reunification. Hosts symposiums, collaborative action networks, and publishes local data on community outcomes and indicators. The goal is to remove educational disparities and improve children’s success by aligning the efforts of schools and community organizations. The program provides home visiting services for at-risk families to build resilience through the development of protective factors. The goal of the program is for all children to enter kindergarten with social, emotional, and academic skills by giving parents information on development, access to resources, and supporting healthy relationships. Harrisburg Early Learning Center provides early childhood education to the children of Boone County, preparing children for entry into kindergarten, involving parents in the education of their children, providing quality and structured before and after school programming and summer enrichment programming. Home visiting, therapy, parenting education, and case management services are provided to parents, caregivers, and their children to increase timely access to pregnancy, parenting, and mental health services for families. The program provides education and development of lifestyle habits that reflect the importance of quality food selection and positive activity choices for children enrolled at Mary Lee Johnston Community Learning Center. Nutrition events are held for families enrolled at Mary Lee Johnston Community Learning Center and other early learning centers. MACC offers scholarships for childcare providers and high school students to obtain their Child Development Associate Credential. MACC also provides training and coaching in HighScope, an evidence-based curriculum for early childcare providers. The program implements the evidence-based intervention, Triple P, which increases knowledge, skills, and confidence of parents to reduce the prevalence of mental health, emotional, and behavioral problems in children. Triple P is implemented through a community-wide mental health campaign, complementary parent education and support services, and training social service professionals. They also provide evidence-based screenings with the Family Access Center of Excellence (FACE). SOAR provides coaching on screenings and best practices for childcare providers to enhance the social and emotional well-being of young children. SOAR staff also provides Child-Parent Psychotherapy interventions for children and their families who are experiencing mental health crises. HealthySteps for Young Children connects with families during pediatric well visits as part of the primary care team. They offer screenings, help with complex parenting issues, guidance and referrals, care coordination, and home visits. The BRIDGE supports families experiencing poverty in the first few years of elementary school in collaboration with the children’s teacher. The program helps build social-emotional skills within children and build resiliency in both children and parents. BRIDGE also provides training to teachers to understand the impact poverty has on child development and learning. TOP encourages schools and counselors to recruit students to lead community service activities, discuss current issues, and utilize TOP curriculum that focuses on health education. The purpose is to encourage healthy behaviors and community engagement for youth through Positive Youth Development strategies. SEED Success establishes Children’s Development Accounts (CDAs) for kindergartners in Columbia Public Schools and Boone County rural school districts. The goal is to strengthen a child’s access and capacity to achieve financial capital accumulation and integration into educational and financial systems. The BCSMHC provides universal screenings for all Boone County students to provide targeted, evidence-based interventions and trainings. The goal is to reduce risk factors, promote existing strengths, and improve coordination of services for at-risk youth and their families. The MU Bridge Program provides school-based psychiatric services and nurse case management for Boone County children and adolescents who are in need of psychiatry services. The goal of the program is to decrease the wait time for children to access psychiatry services. Boys and Girls Club provides after-school and summer programming designed to empower youth to excel in school, become good citizens, and lead healthy, productive lives. CMFCAA provides respite events for children and youth who are in foster care or waiting to be adopted. The goal of the program is to decrease family stress, increase social skills, and strengthen relationships. CMFCAA provides training and support services to help increase and maintain the number of licensed foster, adoptive, relative, and kinship families in Boone County. Columbia Housing Authority (CHA) Low-Income Services, Inc.
Health Home Connections improves the socioemotional well-being of families and children with low-income. Families are connected to community support services which strengthen families and help children succeed. Therapeutic Mentoring is also available through Big Brothers Big Sisters. MAP provides education enrichment for children and youth of families who participate in CHA Housing Voucher program. The Boone County Children’s Services Fund supports Trauma Informed Therapeutic Art Making for MAP enrolled students with the goal of increasing protective factors and youth engagement that builds resilience and strengthens social bonds. YC2 organizes, supports, and builds the capacity of local coalitions in Ashland, Centralia, Columbia, Hallsville, Harrisburg, and Sturgeon. YC2 informs these coalitions through community needs assessments to advocate for and deliver services to promote strong families and successful youth. The program provides nutrition and garden-based education to eight Columbia elementary schools with high rates of children participating in free and reduced lunches. CCUA also teaches low-income families with children how to grow their own produce efficiently and how to prepare healthy meals through the Opportunity Gardens program. The goal of this program is to train and equip Coyote Hill mental health professionals and direct care staff to provide expert level trauma-informed care to children in crisis to increase the likelihood of better outcomes for children. Trainings in Trust-Based Relational Intervention® and Suicide Prevention is offered to Boone County providers. Fun City Youth Academy provides programming during the summer and on Saturdays during the school year. The goal is to improve mental health outcomes, promote healthy lifestyle choices, and strengthen family units for youth under the age of 19. Heart of Missouri CASA provides child advocacy services for children involved in abuse and neglect court cases. Services are provided by trained volunteers to help find safe, permanent homes for children who have been abused or neglected. Trained mentors support youth to attain goals and reduce risk factors through community-based mentoring. The goal is for youth to create positive connections in the community and improve coping skills, pro-social behaviors, and self-esteem. The Children’s Emergency Shelter provides respite care and emergency shelter services for children. The shelter provides children a safe place in order to prevent or remove them from situations of abuse or neglect. Counseling and wellness groups are provided for children and families to address and prevent abuse and neglect. The Youth Outreach Team identifies youth ages 12-19 who are homeless or at-risk for homelessness. The Youth Outreach Team also conducts a needs assessment of homeless youth to provide a foundation to effectively address youth homelessness in Boone County. The program provides parenting skills education to at-risk parents and families to diminish child abuse and neglect. Class topics include: self-care, stress and anger management, child development, communication skills, positive discipline, accessing community resources, etc. The program provides financial match for SNAP and WIC participants at the Columbia Farmer’s Market. The goal of the program is for voucher users to experience lower rates of stress related to food insecurity and for one or more family members to experience the benefit of changes in health status attributed to their access to fresh, local products from the farmers market. True North’s Children’s Program provides children and their parents, who are survivors of domestic or sexual violence resources that promote emotional resiliency and healthy attachments. This is achieved through family education, parenting skills training, positive youth development, crisis intervention, and case management. The Family Health program provides services for underserved clients that are 19 or younger who have behavioral health issues and their families. The goal of the program is to improve mental and behavioral functioning, daily living skills, and academic performance. The program provides comprehensive, multi-faceted behavioral health care interventions which includes individual and family counselling services, psychiatry, and medication management. The funding goal is to provide care for underserved and uninsured Boone County residents. The equine program is a vital part of serving children at Coyote Hill. The program is able to reach children and teens through conventional equine recreational activities, and therapeutically by using the effective and clinically proven intervention of Equine-Assisted Psychotherapy. Some vocational skills training is also part of the youth experience while engaged with the equine at the arena. The program provides acute dental needs and preventative dental care with the goal of preventing subsequent avoidable emergency room visits to realize cost savings. EAIS-ON provides prevention services for Boone County children and families prior to abuse, neglect, and/or traumatizing removal of a child from their home. The goal is to prevent child abuse and neglect, improve parent-child relationships, and reduce out-of-home placement. The program offers two types of treatment interventions to adults and children with a history of trauma. HeartMath utilizes assistive technology to provide immediate heart rate variability feedback so clients can practice self-regulation techniques to improve resilience and general health. The Safe and Sound protocol targets auditory sensitivities found in those who have experienced trauma or traumatic stress to improve listening and social engagement behaviors. The goals of the program are to improve the health and quality of life of individuals impacted by alcohol and other drug use disorders through improved access to treatment and community collaboration. The program provides evidence-based assessment and treatment for children, adolescents, and their families for a variety of emotional and behavioral difficulties. The Psychological Services Clinic lso provides Multi-Systemic Therapy, an intensive family- and community-based treatment, for youth and their families referred by the Boone County Juvenile Office. The program provides services to encourage eating healthy and being physically active. The Boone County Community Health Fund also supports an awareness campaign highlighting the dangers of e-cigarettes and JUUL use and a cigarette cessation program for young adults. CCUA will provide nutrition- and garden-based programming at the Agriculture Park to improve fruit and vegetable consumption for all ages. The Central Pantry provides food and groceries to those in need in Boone County. Harbor House provides shelter to improve the well-being, personal safety, and the physical, mental, and emotional health of homeless adults and families. SIL provides services for seniors that include: food delivery, friendly visiting, home repair, lawn care, and case management. The goal of the program is to help low-income seniors live independently, make homes safe, and alleviate isolation/depression while improving overall quality of life and health. True North provides victims of domestic and sexual violence with safe housing, advocacy, and support. The program provides social enrichment and care through exercise, activities, meals, and nursing visits for elderly and/or adults with disabilities. The goal is for individuals with limited income to remain at home longer and demonstrate higher life satisfaction. Caregivers of the participants also report less stress and higher life satisfaction. 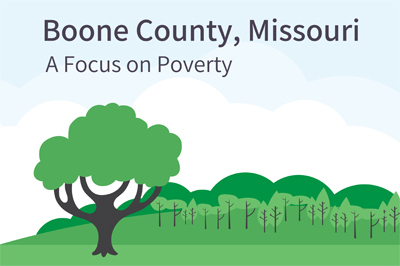 The program provides a variety of services that specifically address and meet needs for assistance with health, employment, and safety for low-income Boone County residents. The program helps low-income Boone County residents gain stability in their housing situations by moving into permanent housing or be assisted to remain in their current housing. The goal of this program is to promote the health and well-being of both children and adults in Southern Boone County. The program provides physical activity training for adults transitioning from physical therapy with the goal of addressing chronic disease risk factors. YMCA also provides programming in Southern Boone County schools to encourage students to make healthy habits related to physical activity, nutrition, and limiting screen time.